This weekend marks a year since a "major incident" was declared on the Somerset Levels. The worst floods ever seen there prompted huge support for local residents, some of whom have still not returned to normal life. But this winter many of them are looking forward with new confidence. You look at it now and you can see that the river's flowing quite nicely. There's a big capacity there and I feel really happy to be living where we live. Insurers have warned flood defence spending must rise to a £1 billion a year over the next decade to prevent scenes like those which devastated Somerset last winter. The Association of British Insurers is also calling for an end to building new homes in flood-risk areas. It says some 20,000 new properties are being built on the floodplain each year, including 4,000 in places where there is significant risk of flooding. A builder has been ordered to pay £2,500 for opening a sluice gate on the Somerset Levels at the height of the floods. Thousands of flood victims across our region are facing spiralling insurance premiums this winter - while others can't get any insurance at all. That's despite more assurances from David Cameron in the aftermath of the winter storms that hit Devon and Cornwall - and months of flooding on the Somerset Levels. But some are now facing a fivefold increase in their premiums - or are facing winter without any cover. Here's David Woodland. That's despite more assurances from David Cameron in the aftermath of months of flooding on the Somerset Levels. A fifth of the 126 flood victims at Moorland on the Somerset Levels haven't been able to get buildings insurance this year. Others have seen huge hikes in premiums even if they didn't flood. The swollen River Parrett runs next to Rebecca Horsington's Farmhouse but it has never flooded the house, as it overflows in the other direction. Despite that she was told her insurance would rise from £425 to £3500. It makes a nonsense of what has happened here because we have had the dredge happen, we've had flood defences put in, so really our flood risk is a lot lower than it was before the floods hit and therefore the insurance premiums should be reflecting that. The swollen River Parrett runs next to Rebecca Horsington's farmhouse but it has never flooded the house, as it overflows in the other direction. Despite that she was told her insurance would rise from £435 to £3500. Flooding fears are on the rise on the Somerset Levels as people endure increased river levels and a week of rain. The rain, which started on Monday, is set to continue until the weekend but agencies say that a repeat of February's flooding is currently unlikely. The River Parrett is rising at Burrowbridge and some fields nearby are partially flooded. But the Environment Agency says there isn't a major risk. There may be further isolated showers over the next few days but river levels are dropping and the risk of flooding is very low. We'll continue to monitor river levels closely and keep local communities informed. 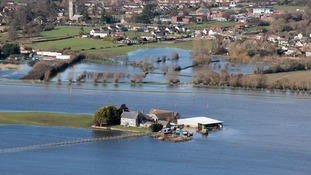 In Somerset, some agricultural floodplain is currently storing water as a result of planned management of river levels. This is completely normal for this time of year. We are not expecting any properties to flood. It would take very heavy rainfall over a long period of time to put homes at risk.